No more spills. No more mess! Avoid soiling of plastic urinal: never clean a urinal again! The super absorbent pad turns up to 16oz of urine into a gel: no more spills or splashes! 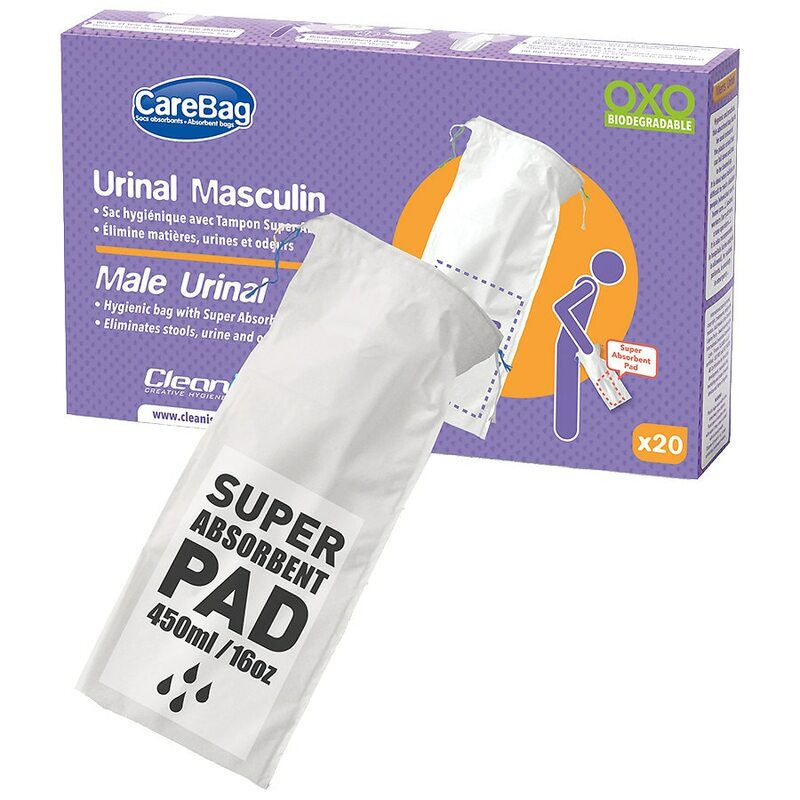 Carebag Male Urinals are 100% Oxo-Biodegradable! The Oxo-Biodegradable Carebag Male Urinal is a great solution for long trips or for anytime a toilet is not available or out of reach. Our discreet & compact design allows it to conveniently fit inside a jacket pocket, purse or glove compartment. It is a medical grade bag equipped with a unique super absorbent pad designed to effectively catch and contain up to 16oz of urine and will spare you the trouble of cleaning up liquid waste in case of incident. No more mess, Avoid the hassle of hand cleaning unsanitary plastic urinals. Designed for both male children and adults, it is the ideal solution for when a toilet is out of reach. The Carebag Male Urinal is a must have for people in the car service industry or simply for people traveling. Fold-able, discreet, ready and easy to use. Keep one with you at all times. Open the bag, hold it with both hands and urinate inside the bag. Body fluids turn into gel within seconds. Plastic bags cause suffocation, keep away from children. Flush eyes or sensitive areas with water if they come in contact with enclosed powder. Dispose of properly, or, in case of infection, in biohazard wastes.